New Bus Shelters in Lower Street, Haslemere. Your feedback please. Together the shelters will provide 12 metres of covered, lit waiting area for those waiting to be picked up or dropped off before catching the train or school buses. The need to provide alternative sheltered, lit pick up zones in order to reduce congestion at peak times in the station forecourt was identified as a priority by the Haslemere Station Travel Plan. This entry was posted in Haslemere first and tagged Bus Shelter, Haslemere, Haslemere Community Rail Partnership, Lower Street, South Downs National Park, Station on January 18, 2017 by admin. 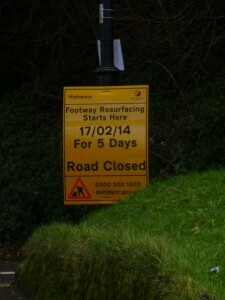 Lower Street and Upper Pavement in Haslemere will be closed from 17th February for 5 days. This is for footway resurfacing. This closure means the railings work on Upper Pavement will be completed. This entry was posted in Haslemere first, Surrey News Updates and tagged Haslemere, Lower Street, Surrey County Council, Upper Pavement on February 16, 2014 by admin. Here’s my Councillor update from recent weeks. 1. Waverley Parking Review: parking proposals discussed at Local Area Committee Meeting December 13, 2013. Necessary changes proposed based on safety, accessibility and efficiency of parking capacity. The statutory traffic order notices marking the start of the 28 day consultation period will be printed in the Haslemere Herald in the first week of March, 2014. To speed up the decision and implementation process, a special parking meeting, open to the public, will be held on May 9th, 2014 (ahead of the July LAC), 1.30pm, Godalming Baptist Church. 2. Foster’s Bridge: To address the flooding problem, SCC Highways have recently installed six new gullies, and installed larger frames and lids on the six existing gullies to increase the catchment area for runoff. To reduce the debris that currently washes down into the gullies during heavy rains from the railway embankment, a retaining curb has been constructed. In the longer term SCC is carrying out an investigation into the issue and I have secured Local Area Committee funding to carry out any more significant works should they be identified as necessary. 3. Haslemere train station, Multi-Storey Car Park planning application: Met with Jeremy Hunt to express my concerns about the current application. This letter sent to Secretary of State for Transport, Patrick McLoughlin outlines these issues. 4. David McNulty, Chief Executive Surrey County Council Haslemere visit 17th Jan, 2014 (find briefing note for the visit here). I wanted to show David McNulty that, while the perception of Haslemere held by many I meet up at County Hall that Haslemere is indeed one of great privilege, such a view fails to recognise that Haslemere is also a community facing many challenges including economic hardship and isolation. The aim was for a range of members of our community to be heard first hand by the Chief Executive so that any future strategic or operational discussions, relevant to Haslemere, at Cabinet and Executive level would be based on a more informed understanding. Helen Bowcock, High Sheriff for Surrey joined the visit. The feedback from the visit was extremely positive. Funding the bus shelter may mean that funding for the Haste Hill railings work will not be possible this year from SCC members’ allocation. To be discussed with HTC to understand if HTC Community Fund/Lengthsman Scheme funding could be used for this project. 6. Shepherds Hill/Lower Street Railings: Held lengthy discussions with SCC Highways. John Hilder, SCC Highways sent the following to residents to explain the SCC position. I am writing to reiterate my decision, which remains as before, that incurring further public expense on replacing or materially altering the railings installed in Shepherds Hill last year is not justified, and that we will now proceed with completing outstanding works on these and the railings in Lower Street, as well as resurfacing the footway there. To recap – the then SCC councillor, Steve Renshaw, sponsored the new railings in both roads using his member allocations accumulated over two years. A consultative group intended to agree the style of the new railings and comprising borough, town and county councillors & officers was established but failed to meet, and the style was eventually selected by WBC planning/conservation officers. There have been complaints about the lack of consultation with residents, but Steve Renshaw, representing the residents of Haslemere, did not require such consultation and SCC Highways would not normally consult residents for this type of project, rather the relevant planning and conservation authorities. I have agreement from SCC and WBC that if residents approve, planters will be provided for the railings on Lower Street. 6. Youth Task Group, Jan 20th, 2014: discussion of Local Prevention Framework, Services for Young People and the Individual Prevention Grants. Project Horizon, roads to be reconstructed as part of Program Year 1: Shepherd’s Hill, Courts Hill Road, Weysprings, Sandrock (dates advised as April 2014, but bad weather is causing delay). It was agreed with the Project Horizon team that the junction area of Shepherd’s Hill and Lower Street will be repaired as part of the Shepherd’s Hill reconstruction. Family, Friends and Community Support team, highlighted the role of Surrey Information Point- www.surreyinformationpoint.org.uk – for care, community and health information and support available locally. Any local group providing community services is encouraged to include their details on the website. Surrey Cycle Strategy, Local Area Committees have been given the responsibility of preparing local cycle plans by the end of 2015. I raised the issue of improving provision for cyclists within the road resurfacing project known as Project Horizon. 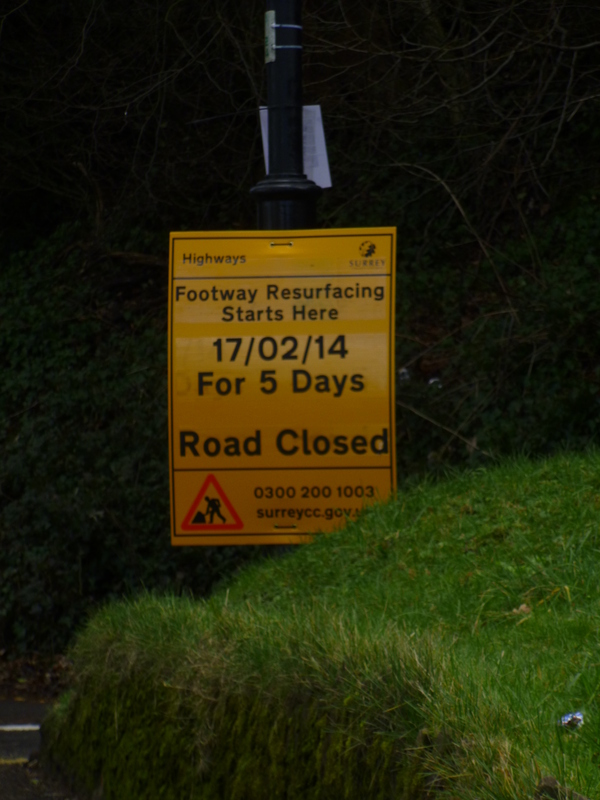 The SCC Highways team confirmed that Surrey’s cycling team will be involved when resurfacing is planned. It was agreed during the meeting that the Waverley Cycle Forum should be involved in both local cycle plan, and Project Horizon discussions. VAS speed sign on Grayswood Road approach into Haslemere has been vandalised. Repairs will be carried out in the next 2 weeks. A number of street lights are not working. Skanska will be repairing in the next two weeks. Fallen trees are blocking the footpath that runs parallel to the railway line from St Bart’s Church to the back of High Lane. A ‘vegetation gang’ will be working next week to remove these and other fallen trees. I am meeting with members of the SCC Strategy team to discuss commissioning a full transport/movement study for Haslemere, including some scenario visioning along the lines of the current Guildford City Council project. 7. Meeting with Haslemere Town Council on 30th January 2014: Presented a summary of the above items to the members present. National Libraries Day is a successful initiative for advocacy; on the day there will be events in libraries throughout the county resulting in media and social network interest. Haslemere Library will be promoting what they do and why it is valuable during their event. Follow Haslemere Library on Twitter, @HaslemereLib. Road users were advised that the planned full closure of the A3 Hindhead Tunnel in Surrey for Friday 31 January and Saturday 1 February were cancelled due to poor weather conditions. Forecast weather of strong winds and heavy rainfall meant that it would be unsafe to carry out the work and operate a full closure of the tunnel. The closures are required for systems maintenance to be carried out, both inside and outside the tunnel, and these will now be rescheduled. Visit Surrey-i, http://www.surreyi.gov.uk/MainMenu.aspx type “Surrey Uncovered” into the search box, Google style, and have a look at the wealth of insight we have made publicly available. 11. Wey Hill Fairground Public Inquiry: I very much welcome the decision of the Planning Inspectorate to change the venue of the Fairground car park public inquiry from Godalming to Haslemere. GIven the strength of public feeling about the Waverley’s planning application that has resulted in this public inquiry being called, it would be an extraordinary decision to choose a venue outside Haslemere. While I support the inquiry as part of a democratic process via which the community will be given the opportunity to express their views about the resurfacing an area of common land and the installation of lighting columns and pay and display meters, I am most concerned that WBC have set aside £30,000 of tax payers money to fund this inquiry, (initially £20,000 was set aside with, I understand, a further £10,000 recently agreed). Given the current financial cut backs facing local government services, and the strength of public opposition to Waverley’s plans for the site, I would suggest that a far better use of £30,000 of tax payers money would be to resurface the site and let it remain as a valuable source of free parking for both commuters and all those that use the short stay parking to visit the public library, shops and businesses in Wey Hill. I urge everyone to attend the public meeting on April 8th, 9th and 10th to express their views. It will be held at The Royal School, in Haslemere. This entry was posted in Councillor Barton Update, Haslemere first and tagged David McNulty, Fosters Bridge, Haslemere, Independent, Local Area Committee, Lower Street, Member Allocation, Multi-Storey Car Park, Parkiing Review, Shepherds Hill, Surrey Cycling, Youth Task Group on February 2, 2014 by admin.